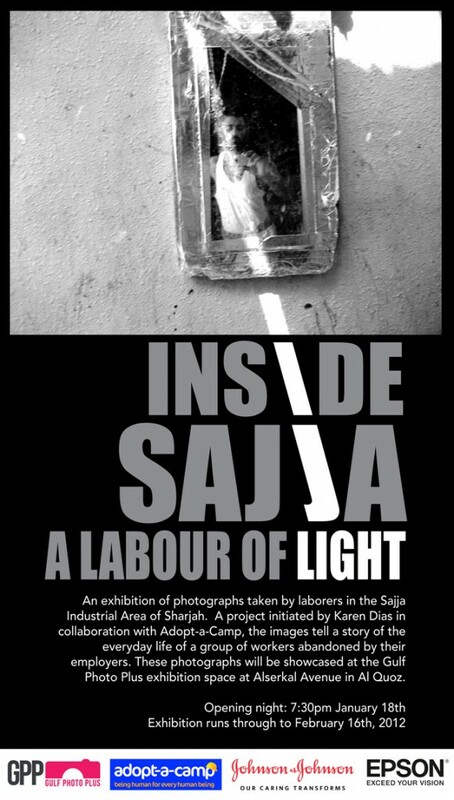 Gulf Photo Plus and Adopt-a-Camp are pleased to announce the exhibition Inside Sajja | A Labor of Light. The exhibition is a visual exploration by a group of abandoned laborers, of their living environment in Sajja, an industrial area in Sharjah, as photographed by themselves. As a result of the economic downturn, a labor supply company’s owners absconded and fled the country leaving their employees stranded. The workers were owed numerous months in back wages and without access to their passports, were left to struggle in a camp void of basic necessities, lacking running water, and electriity. Saher Shaikh, the founder of the non-profit Adopt-a-Camp organization, discovered the plight of a particular group of abandon laborers two and a half years ago and “adopted them”, providing support in a variety of forms supplying everything from basic necessities to emotional support and new employment opportunities. Karen Dias, a documentary photographer based at the time in the UAE, became aware of the Sajja abandoned laborers after the efforts of Adopt-a-Camp brought their story to light. Dias approached Shaikh with a proposal to share her photography skills with the Sajja laborers, through donated cameras and workshops offering the basics of photography. Gulf Photo Plus became involved in the project by organizing the exhibition, where prints and postcards featuring the photographs taken by the laborers of Sajja will be on display and available for sale within the Gulf Photo Plus gallery space. Each print will be available for 400 AED, with postcard-sized prints also available for 20 AED. All proceeds from the print sales will be distributed directly and evenly to the workers involved in the project. The exhibition opens on January 18, at 7:30pm where the laborers themselves will be present to connect with visitors and encourage further dialogue about the project. The exhibition Inside Sajja: A Labor of Light runs January 18, through to February 16, 2012 and has been generously supported by Johnson & Johnson as well as Epson. To view the full press release, download here. 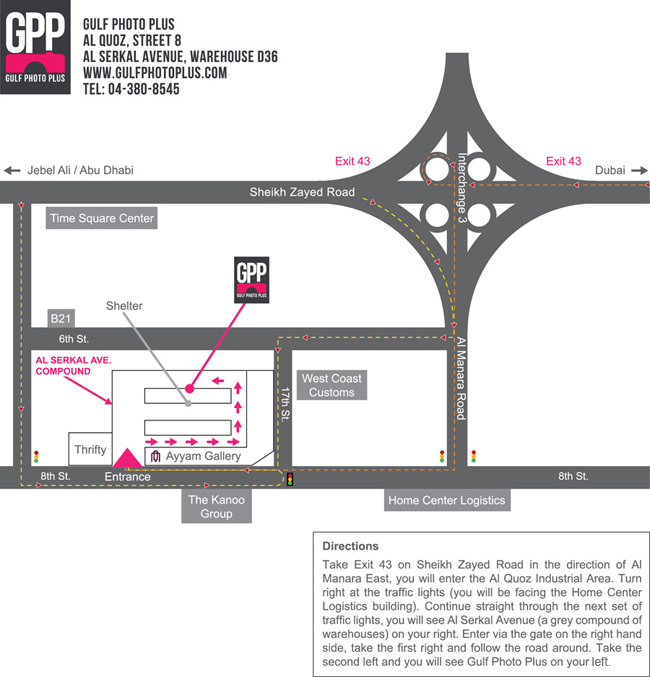 For more information or press inquiries, please contact miranda@gulfphotoplus.com. For more about Adopt-a-Camp, please visit the Facebook page.